DHARAMSALA, India (CNN) -- Gedun Gyatso, a 27-year-old Tibetan Buddhist monk, is so devoted to the Dalai Lama that when he was in prison, he placed a picture of him next to his pillow in open defiance of his jailers. The gesture earned Gyatso another month of incarceration on top of the three years he had served for his political activity. 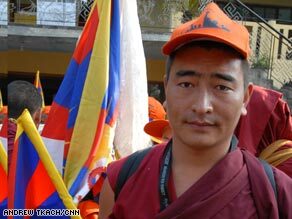 Monk Gedun Gyatso, 27, disagrees with the Dalai Lama's willingness to accept Tibetan autonomy within China. In the fight for freedom and democracy, their weapon is peace. Go inside the world of Buddhism with CNN chief international correspondent Christiane Amanpour.